Cats are masters at hiding signs of illness or pain. By the time they show symptoms, they’re often really sick. By learning what is normal for your cat, and keeping an eye on even subtle changes, you can get your cat to a veterinarian before problems become serious. Cats are creatures of habit, and even subtle changes from their normal behavior and routine may be cause for concern. Changes in appetite, drinking habits, litter box routine, grooming and even the sound of your cat’s voice can all be signs that something is wrong. In addition to watching for subtle changes, one of the best ways to monitor your cat’s health at home is to perform periodic health checks on your cat. These monthly checks are not a subsitute for regular veterinary care. All cats should receive at least annual exams by a veterinarian; cats older than seven years should receive bi-annual exams. Your cat’s weight can be a good indicator of her health – but only if you keep track of it. Gradual weight loss or gain can be difficult to recognize in cats. Ideally, you should purchase an inexpensive digital scale designed for babies. These scales measure pounds and ounces accurately. Alternately, weigh yourself on a regular bathroom scale, than weigh yourself while holding your cat. The difference is your cat’s weight. While not as accurate as on a baby scale, this will still allow you to notice some fluctuations. Your cat’s coat should be full and shiny. Skin should not be dry and flaky. Your cat’s nose should be moist and clean, not dry and chapped. There shouldn’t be any discharge or bleeding. The ears should be clean and dry. A small amount of ear wax is normal, and can be gently cleaned by dipping a cotton ball into a warm water and vinegar solution. If you notice any discharge or odor from the ear canal, this may be a sign of infection. A coffee-ground like brown or red discharge from the ear may be a sign of ear mites. Eyes should be clear and bright, with no discharge. Your cat’s third eye lid may sometimes come partially across the eye when he’s sleepy, but it should not be visible all the time. Pupils should be equal size, and react to changes in light. If your cat will let you, gently open his mouth to check his teeth and gums. If his gums are red, or there’s a strong odor coming from his mouth, your cat has dental disease which will need to be addressed by a veterinarian. Other signs of more advanced dental disease include difficulty eating, excessive drooling, and pawing at the mouth. Your cat will need to have his claws trimmed regularly from time to time. This is also a good opportunity to check for any torn toe nails or injuries to the paw pads. Claws that are too long can get caught on carpeting or upholstery and get torn. If you have trouble trimming your cat’s nails, get someone to help you or take your cat to the veterinary clinic for a nail trim. Your cats breathing should be smooth and effortless. A cat’s normal respiratory rate is between 20 to 30 breaths per minute at rest. You can measure this by timing your cat’s breathing for 15 seconds and multiplying by four. Wheezing and coughing are indicators of potentially serious problems. Rapid, labored or open-mouth breathing can be life-threatening and requires emergency medical attention. Gently pinch the skin between the shoulder blades into a little tent. The skin should spring back into normal position almost immediately. Another way to check for hydration is to make sure that the gums are moist to the touch. Does your cat appear uncomfortable or stiff when walking? You may be looking at signs of an injury, or arthritis. Run your hands all along your cat’s entire body with gentle pressure. 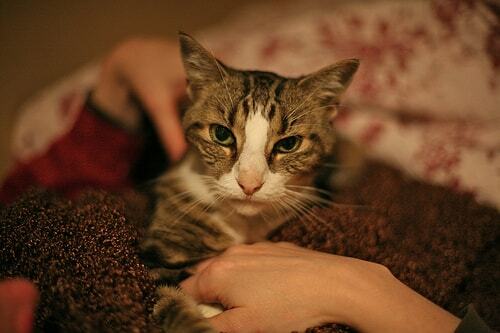 If your cat responds with discomfort in any one area, or if you notice any lumps and bumps, take your cat to your vet. By performing this monthly check, and keeping tabs on your cat’s normal behavior, you’ll be able to notice any changes immediately, and ensure that any problems are addressed before they become serious. Thank you for sharing this. It will definitely come in handy for me. I knew some of the things to look for, but not all on the list. And, I didn’t think of doing them monthly. As long as you’re feeding her wet food, she’s probably getting enough moisture from the kitten milk replacer and her food. Gently placing her in the litter box should be enough to get her using it. Being in rescue for 30 years I do these things on a reg basis and also with the doggies! Ingrid, I love this thorough but concise list and will share and refer to it, I’m sure. Thank you! Thank you for sharing the list, Liz! This is so useful and helpful Ingrid, thank you so much! Yes. THIS is how I discoveed The Lump on Princess’s chest – it was cancer– I know it was not there the previous time I checked (which was the day before). I brush my kktties every day and “massage” them all over as I brush them– anything out of the ordinary– i will find. That’s pretty scary how fast that cancer came on, Azar. Brushing and massaging is a great way to detect these changes. Important information Ingrid – thanks so much! With Sam being such a great “lap cat” I have a lot of opportunity to check him over closely on a frequent basis – and I try to pay attention to his general “demeanor” to look for signs of any kind of problem….BUT, as you say, they are masters of deception. Sam has a great vet and hopefully with all of us looking out for him, we’ll catch any problems early on – now that he’s twelve it’s on my mind a lot. Checking your cat while you’re sharing lap time is a great way of doing a regular health check, Pam. Thanks for sharing my posts, Tracy! Great blog post. We’ll start doing these at our house. Ingrid, this is the first line of defense in our cats’ health–our own observations. It’s very important to convince your cat this is fun and perform it regularly, especially with more than one cat in the house–it’s easy to lose track of their individual traits. Now that I work at home I have plenty of opportunities as each of them cross my lap daily, but when I worked out of the home we had a claw-trimming party once or twice a month complete with treats or a special meal to entice patience. I’m trying to picture a claw trimming party at your house, Bernadette! You’re right, working from home provides more opportunities for observing even slight changes from the norm. A very thorough post about a home health check. May I share this on The Tiniest Tiger page? Of course, Gracey! Thank you for sharing it! SUPER important information and this is a MUST KEEP post to refer to regularly!! So glad you found it helpful, Caren!